Canada's premiers recreated an important moment in Canadian history during their annual summer meeting on Thursday. The premiers posed on the steps of Government House in Charlottetown to recreate a Sept. 6, 1864 photo of the delegates to the Charlottetown Conference, which launched Canada's journey to Confederation. Post by Prince Edward Island Government. One of the most notable differences in the two photos is Canada's two current female premiers – Ontario's Kathleen Wynne and British Columbia's Christy Clark. Female politicians would have been out of the question 150 years ago when the photo was first taken. Despite the progress, a number of commenters noted they would like to have seen more than two female political leaders in the shot. "It's awesome to see women in the new edition but we still have work to do," Amanda Butler commented on the Facebook post. Others commenters drew attention to the lack of diversity among Canada's political leaders in both photos. Government House has placed markers on the steps of the building to help visitors determine whose spot they are standing in. 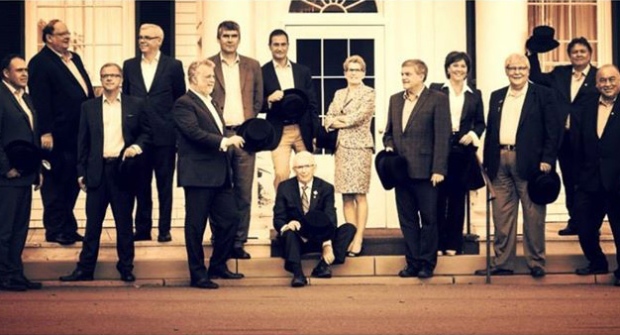 The current premiers did their best to capture the details of the original photo, with some holding top hats and canes. The original photo included Sir John A. Macdonald before he became Canada's first prime minister. 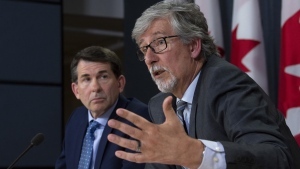 Prime Minister Stephen Harper has been asked to join premiers' meetings in the past, but his former communication's director previously said Harper prefers one-on-one meetings with the provincial leaders. The last time he met with the premiers collectively was in 2009 to discuss Canada’s response to the global economic crisis.